I’m battle weary with just enough left to fight the final fight. This is it.. September 16th, Testing begins. Our plans all had to change again, we had lots of plans that could have generated income to help. We were approached when we asked for help with a website – we paid half up-front they said they would build it. We were told it was ready, so we paid the final part & then the stories started, lots of excuses and lies. We were running out of time and this was putting everything on hold, rebranding for the successful #FabFudge business all put on hold for a greedy person who wanted to get easy money from us & saw an opportunity to steal. Don’t worry too much about that, we will be seeing that fella in court. In the meantime, life still had to go on. 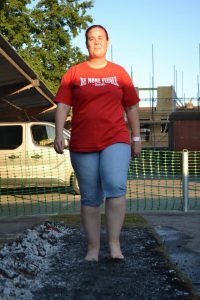 A fire walk was planned & fun was had! Yes, it was hot! 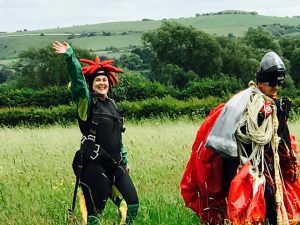 There is a way of doing it without harm so you should go to an organised event if you wish to take part, it’s one of those things that certainly ticks a Bucket List! We knew money was going to be tight & I was getting tired. I realised that treatment in Russia was only just a pipe dream. No matter how hard I tried, the money just wasn’t there. I’d never be good at being a chugger, I sucked at fundraising. I had to rethink India, which broke my heart. I felt petrified of past events there, but with a good talk with the administrators at the hospital a carer was found to stay with me throughout my time in isolation. My family have to stay home (work/pets/etc). My carer had HSCT last year at the same hospital. We email, we link up with video calls. We are ready for this. I feel better knowing I have someone there who knows what will happen to me – I feel safe. I am a warrior and I’ll see you on the other side. Please do keep giving, I have Physio to learn to walk again when I return. It’s been a busy few months. I have a few days of down time so update on the blog time. The last time I posted was to tell you all of my decision to cancel my trip to India for my HSCT. Had I of still been going, I would be doing the packing and all those final bits and pieces by now. I still believe I made the right decision, it seems that everyone that have gone for their treatment have had infections before they start their treatment, now one or two have said that yes, its plausible that the patient would have had and infection as they have been feeling poorly. There is also the wonder if the UK GP’s are checking for infections thoroughly. You’d hope so but it has made a few of us think differently. May, was a tough month for me, still upset about events in April, but determined to move on from it and start to look forward. I gave the bad news to my boss that I would not be leaving work when I was due to. Actually, he was really good about it, understood my reasons. So my HSCT friend Alex Green made contact to remind me that I had agreed to do a parachute jump, he was more eager now to help me raise more funds now that I was at the back of the queue for Russia knowing it was a further $20k more. His family and friends helped raise a further £1,500. They are totally amazing. 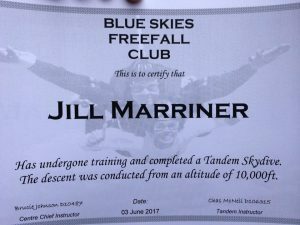 I booked our tandem jumps, my friend from Holland wanted to join in too. Only one thing was in the way, my weight, I had to lose 1 stone before I could jump and just one month to do so. I felt so determined to do it I was so hard on myself, no sweets, no pudding, no ice cream, no treats. I did it, I didn’t want to let anyone down. Truth be told, I was scared. I hate heights I really do. 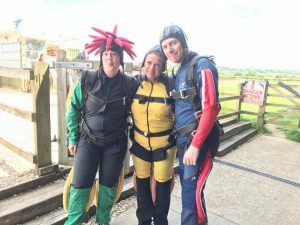 A lot of people do a skydive to raise money for charities and fundraisers. I had a great team with me. My lovely husband was there to reassure me that I would be fine. Alex and his lovely wife Jennifer, Agathe from Holland stayed with us for the weekend, she loved the day, Rachel who helped arrange the day was there to help support me (she jumps all the time, nerves of steel that girl and another MS patient who is fundraising herself for HSCT) Also a surprise, Anne who has had her HSCT at the beginning of the year in Mexico came too, she was still very vulnerable to germs so was careful not to get to close to any of us, No hugs for Anne, I didn’t want to give her anything to compromise her recovery, she was doing well recovering and still is. It was amazing to have so many HSCT patients pre-and post-treatment there with me Anne and Alex doing amazing, Rachel and me still raising funds for our own treatment. 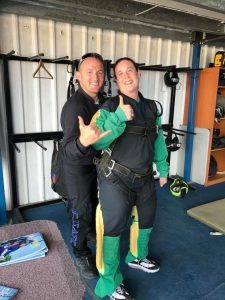 What can I say about the skydive, wow it was amazing but I was scared going up in the small plane, although my tandem instructor Chaz was brilliant, he knew I was scared, told me what to do and when to do it, although he made me wear a silly hat because it was my fundraiser. So up we went to 10 thousand feet, the door opens and I was the first to go. Chaz and me shuffle to the door and as I am attached to him, I am dangling out of the plane legs and arms in position, we jump I close my eyes, I psyche myself to open my eyes, we are free falling through clouds, I hold my breath…. Yes, I know. I remembered what they said in training I can breathe through clouds (see I’m not the only one if they tell you that in training) we are falling, falling fast we’ve hit terminal velocity. Quite calmly I look down and think ok this is it, this is how I die I have no control… then woosh up we go as Chaz opens the parachute, I look around things look like i’m viewing via a goldfish bowl with the goggles on, Chaz tells me to take them off and really look around, wow what a view. Did you know that the parachute’s are computerised now, If Chaz didn’t open the chute with the first pull, there is another pull he can use, plus the computer knows what height and speed we are going and if we fail to open the chute, it would do it for us. We descend very, very slowly, there isn’t a breeze, it gives me the opportunity to look for Alex and Agathe who have also jumped, Agathe is screaming with joy she is almost down, she jumped after me, Alex is high above us laughing. We get ready to land and I try to get into the landing position which is difficult to do when you falling, I can’t do it, Chaz takes control and tells me to do another position which I could do and he gets us down safely, although I hear a crack as we land, oh no I think, I broken a bone oh god no I have work Monday, I tell the sky dive team who run towards us, Chaz unclips us and I am asked to try and move slowly, I get up on my knees, ok no pain, I haven’t broken anything. Phew thankfully it was a twig. I didn’t feel the rush of adrenaline that most do, would I do it again, hopefully not. But I am proud that I did do it, one off the bucket list and all that. We also were invited to do Vegfest Bristol, we spent weeks making vegan fudge, it was a brilliant show, we made lots a of new friends, we were invited to advertise in Cook Vegan. Our advert can be seen in the magazine not online. 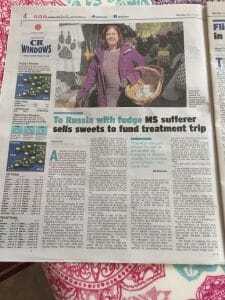 We had the local paper do an article on me the fudge and Russia, loving the title. Even The Sun ran the story. Since April, I’ve been so busy, hardly taking any time for myself, I just wanted to keep busy and not think of what if’s with India, I really cannot believe how much it upset me.. I’m going to Russia, the best place in the world for my treatment, you get what you pay for, that’s why it costs $50k rather than the $30k in India, we have £29k so we need to raise another £13k minimum. Wow a bit of a blog there, well I thought it was time to update, have been so busy I knew that I needed to make time to update you all. We have most of our weekends booked with markets, and have applied for a few more, trying to fit in fundraisers too. A few days ago, I was talking to a friend on Facebook who has battled and won against cancer, she had told me a few weeks ago that it was back. Then she told me that it was terminal, there wasn’t anything else the doctors could do for her, they gave her 2 years, I was shocked and so sad, why was it the good ones why!! 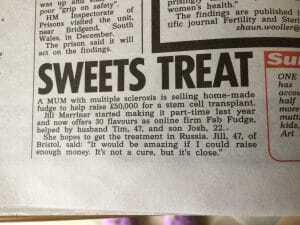 She told me that she wanted to see me have my treatment in Russia before she dies, this makes me more determined to do this to push myself as hard as I can to raise the funds, I can’t let her down, she has been so supportive of me and my journey to HSCT, I must do this, the clock is now ticking. It is with sadness that I had to cancel my treatment for HSCT at Artemis Hospital in India. We were so close to me starting my treatment. There are issues with infection control there especially with Klebsiella pneumoniae. It is with regret that two wonderful women in the past week have lost their lives during treatment. With patients contracting infections whilst in hospital, although being treated, it was too much for me. HSCT is a horrific treatment for your body to endure, complications can be deadly if not dealt with and kept under control. The staff are loving and caring but watching videos and blogs of past patients, it is worrying for me that not all staff in your isolation room wear appropriate apparel at all times, gloves or masks missing. It is a terrible time of sadness of two warriors who lost their battle, my heart goes out to their families at this most difficult time. I will leave their names out, the families need time to grieve. I have cancelled my treatment for India due to being scared, I will be there on my own with no family or friends, lost in translation. The hospital I believe is not ready for international patients. I had already given up my previous Russian date for HSCT in favour for the cheaper treatment in India money which we (thanks to you all) had managed to raise $30k. I have emailed The A.A. Maximov Department of Haematology and Cellular Therapy, National Pirogov Medical Surgical Centre in Moscow, asked if I could be added back onto the list knowing I will be at the back of the queue. They accepted me again. I will now need to raise a further $20k. I guess you get what you pay for. Moscow is one of the leading if not the best treatment centres in the world for HSCT. And so back of the queue so maybe be 2018. Of course, as and when I have the full $50k I can let them know I have the money and ready to go. It is with a heavy heart one step forward, two steps back. But I am now halfway with the fundraising. I’m not very good at keeping this blog up to date. Honestly I have had so much going on. Worked all the way up to and including Christmas Eve selling fudge, then spent the following week mostly in bed, exhausted. I remember sat up in bed Christmas morning whilst my hubby gave me my gifts, then falling asleep for several hours, I had pushed my body so hard to get to Christmas Eve knowing I would have a week before returning to my day job. I took a break from the market stall for a few weeks, although we are now in a lovely new location. St Nicholas Market here in Bristol. Every Saturday until just before I leave for India. Our local shop Southville Deli in North Street and in Church Road, sell our fudge, running out often, great reviews from the staff and the customers. So glad you guys love our fudge. We had our inspection from the local council for food and hygiene we got a 5 😀 Although we need bigger premises soon, we are growing which is amazing. More updates soon, just wanted to let you guys know i was still here, just so busy with the day job, the fudge job and the fundraising.